I took the small Sony 3D Handicam to Hawaii. Left the Panny at home as I didn't want to worry about it on such a long trip. I'm not planning to edit the footage into a cohesive video or anything, but I'll get some of the better clips online in the near future. Work continues on the inaugural 3D Blu-ray from Bottoms Up!, a new Louisville-based film & theatre collective. They performed two plays at The Bards Town in early March. Although these are not live on YouTube, readers of this site can get a look at the links below. The 3D version is 1080p and static, while the 2D version is 720p and dynamic (meaning: cuts, zooms, etc). Next up: 2012 Carl Casper Auto Show, followed by the other half of the Bottoms Up! project, Hell's Awesome. Until now, there really hasn’t been a decent prosumer 3D camera. 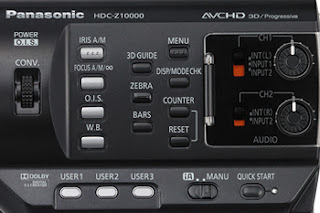 The options were limited to either consumer-grade products like Sony’s HDR-TD10, or professional products like Panasonic’s AG-3DP1. But now Panasonic has released the HDC-Z10000 for the MSRP of $3500. 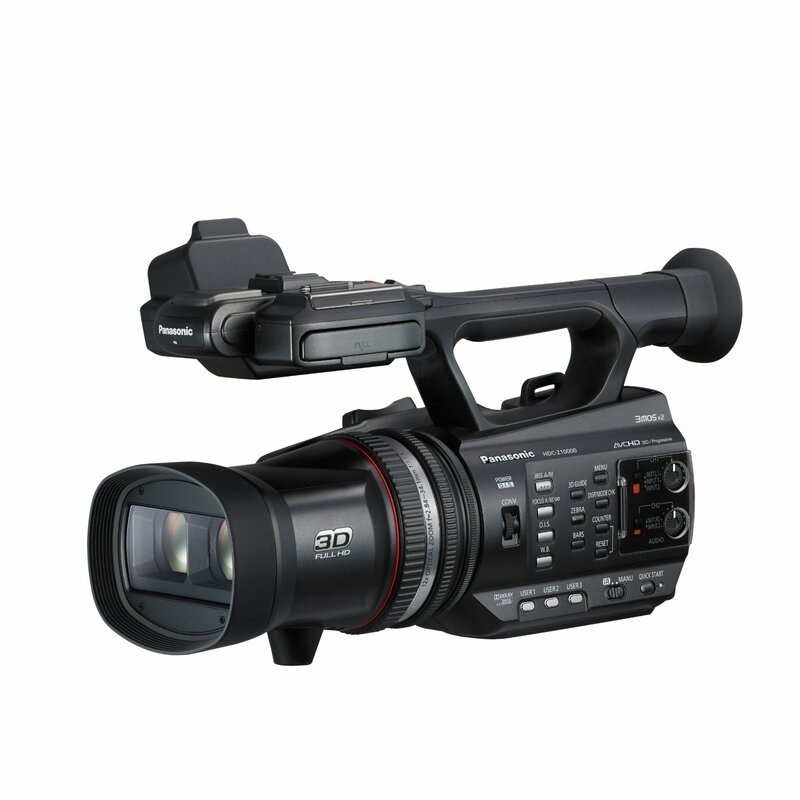 It adds advanced features like separate manual rings for focus, zoom, and iris, a convergence wheel, and dual XLR inputs. But is it worth stepping up from the consumer models? First, a word of disclosure: I bought this camera with my own hard-earned money. I paid $3299 just before New Year’s Eve, although it can now be had for a couple hundred less. 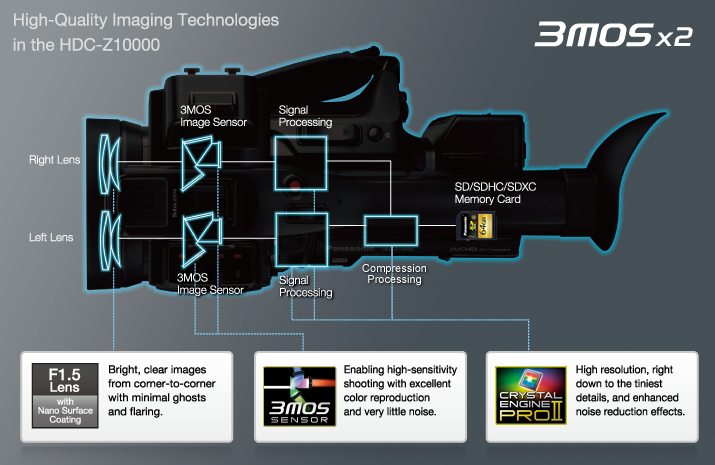 The Z10000 utilized two 1/4.1” imaging sensors, each with 6.21 effective megapixels ((2.07 x 3) x 2). There are two ways to look at the sensors. On one hand, these are the same sensors used in considerably less expensive cameras (such as the newly announced Panasonic HC-X series). On the other hand, these are the same sensors used in 2010’s AG-3DA1, a camera that still retails for $16,000. OK, great, but how does it look? 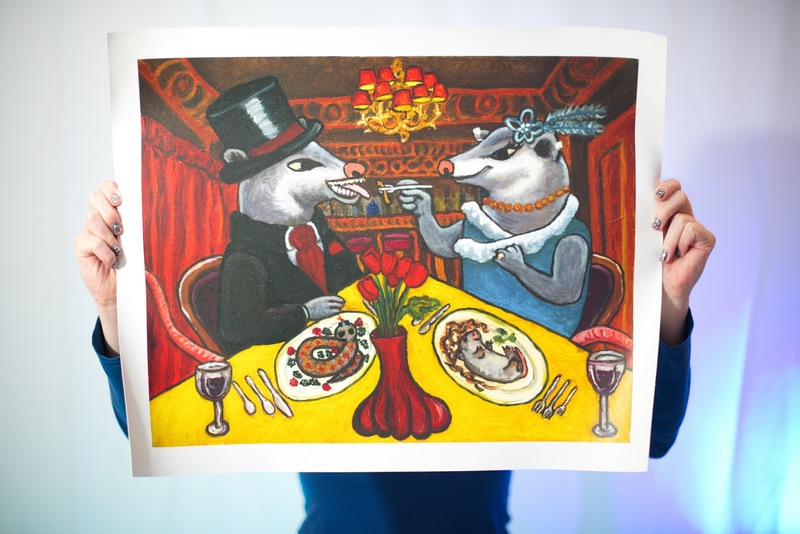 In bright light, the images are stunning. In low light, not so much. I’ve done a half dozen test shoots in clubs and bars and simply cannot get the footage to look good. The pictures are still dark even with the iris fully open, and they get a lot of digital noise once gain is added. But in sunlight or brightly lit rooms? WOW. The colors are amazing. It is easy to avoid overexposure, and the results are highly satisfying. But the crummy low light performance means you’ll need to carefully plan your project around the camera. The built-in microphone can record in 5.1 Dolby Surround, but the sound quality is not excellent. Luckily, the two XLR inputs mean you probably won’t be using the build-in mic very often. I paired this camera with an Audio-Technica AT897 and have been very pleased with the results. Attaching an external mic restricts you to Dolby Digital stereo or LCPM stereo recording. Stick with LCPM for the highest bitrate (1.5Mbps). 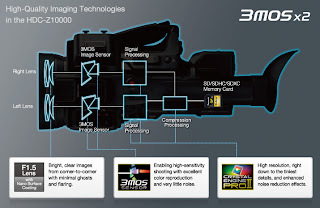 If you’ve used any of Panasonic’s mid-range cameras, you’ll be familiar with the layout here. There are independent focus, zoom, and iris rings up front and a convergence wheel on the side near where the iris wheel was on older models. Shutter speed is adjusted through the touch-screen. It is an OK setup, but I would like more customization. For example, I almost never change iris once it is set for the environment, but I want the ability to control convergence as the camera is moved. The convergence wheel does not lend itself to on-the-fly adjustment. I’d like to swap the functionality of the iris ring and convergence wheel. Can’t. Bummer. A feature from DSLR’s that I used a lot was Focus Assist, where you could temporarily zoom in 5-10x to adjust focus. Not only does this camera not have it, but it is actually not possible to zoom in to adjust focus while in 3D mode. The reason for this is that the convergence is automatically reset whenever you zoom in. There is a Focus Assist feature, but I haven’t figured it out yet. It highlights whatever is in focus in red, but I don’t trust it as much as actually seeing my subject in focus. 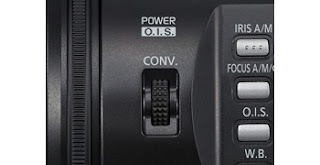 Like many Panasonic cameras, there are user-definable buttons that be assigned to a host of features. There are three hardware User buttons and another four accessible through the touch-screen display. Among the 18 features that can be assigned are: Histogram, Convergence Reset, 3D Macro Mode (for recording subjects 1.5 feet away), and 3D Display Mode. That last one deserves some discussion because it is among the best features of the camera. The LCD display can be viewed in 2D mode, 3D mode, or Mix Mode. Mix Mode allows you to see both the left and right views simultaneously. The subject is converged when the two frames overlap perfectly. Anything closer than the converged subject will appear to be in front of the screen and anything further away will appear to be behind the screen. The Z10000 supports Scene Files, customized settings that fine-tune picture settings for specific environments. Sadly, it does not appear to support the same Scene Files as earlier Panasonic camcorders. Older Panasonic camcorders could access 24 Scene Files while the Z10000 is limited to 6. But 24 settings can be adjusted for each Scene File, including Gamma, Knee, Color Temperature, and Chroma Level. Used properly, these can dramatically improve picture quality in challenging situations. The Zebra function is essential and helps prevent image overexposure. There are two Zebra settings by default (80% and 100%), but you can adjust them to whatever sensitivity you'd like. The camera can record to two SD cards simultaneously, but oddly they cannot be used to record separate left and right streams. Rather, they can record in backup mode (where the same content is written to both cards), or extended mode (where one card will fail over to the other once full). The Z10000 is a mixed bag that, for me, is an essential tool anyway. When I started down this 3D path two years ago, I had to cobble together my own camera from a pair of Canon Rebel T2is and a parallel rig. There were no integrated 3D cameras on the market. In May 2011, I bought Sony’s HDR-TD10, a Handicam that had a single manual dial to control every manual function available (and there weren’t that many – shutter speed and framerate were fixed in 3D mode). Now there’s a reasonably priced integrated 3D cameras with a host of manual controls and customizable features. And it takes excellent pictures in bright light. But low-light performance is poor and some of the most important features are frustratingly implemented. Why are some functions, such as shutter speed, accessible only through the touch-screen? Why is there no Waveform Monitor? Why has support for Scene Files been reduced from 24 to 6? Why can’t I record left and right video streams to the separate SD cards? The next two videos shot with Panasonic's Z10000 3D camera were recorded on a very beautiful day. NOTE: Click through to the YouTube page to adjust 3D playback. Here are the first two videos shot with the Panasonic Z10000 3D camera. These were recorded during Mondo a GoGo at the Magnolia Bar & Grill.